Positive Cash Flow Investment Property is property that pays you every week, just to own it. 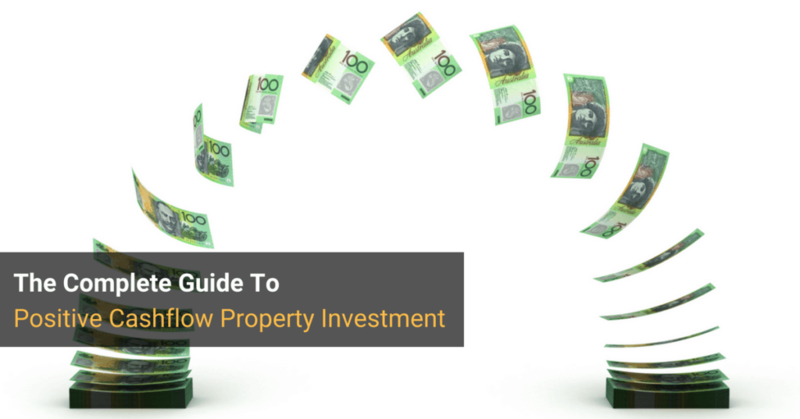 That might sound great (and it certainly can be), but there is much more to cash flow positive property investment than meets the eye. In this article, we’ll explore what cashflow positive is (and is not), as well as cover off some of the benefits and risks of when buying cash flow positive real estate. What is Positive Cash Flow Property? Where To Find Positive Cashflow Properties? 1. What is Positive Cash Flow Property? Definition: Positive Cash Flow Property is an investment property where the annual rent exceeds the total annual expenses, after tax deductions and depreciation are taken into account. In other words, this is a type of investment asset that “pays you” to own it. The potential advantage of cash flow positive property is that it doesn’t drain your household income. In fact, quite the opposite. Earning an annual income from your property is one advantage. The other is that you also have the potential to make a capital gain as the value of your investment property goes up over time. Here’s an actual screenshot of a property investment financial model presented to a client. In this case, the property is strongly cashflow positive. The loan interest is $23,358 in year 1, and other rental expenses amount to $4,125, giving a pre-tax cash flow of minus $3,023. However, there are additional non-cash deductions in the form of depreciation of the building and fittings, plus loan costs, which add up to a further $7,496 in year 1. Non-cash deductions mean tax deductions that you can legally claim, but don’t need to fund out of your own pocket in the form of cash. With $24,461 in total income and $34,979 in both cash and non-cash expenses, the on-paper “loss” in year 1 is $10,518. This on-paper loss enables the investor to claim a further $4,102 in tax back from the taxman. Overall, the after-tax cash flow of this property is therefore $1,079, or $21 per week in year 1. As you can see, the model predicts that the positive cash flow will actually increase over time, as rental increases and other factors are taken into account. In year 1, it’s $21 per week in positive cash flow. In year 2, it’s $31 per week in positive cash flow. In year 3, it’s $34 per week in positive cash flow. In year 5, it’s $46per week in positive cash flow. In year 10, it’s $83 per week in positive cash flow. Now, $21 per week or even $83 per week may not sound like sums of money that will make you rich, but you have to remember that these cash flow figures are money-in-the-pocket, after ALL expenses have been paid. Meanwhile, in the background, the property is appreciating in value. According to this model, this property will accumulate $465,495 in equity in 10 years’ time. Positive Cash Flow describes a property that puts money in your pocket after all costs AND tax deductions, including depreciation, have been taken into account. However, Positively Geared Property refers to property that delivers a cash surplus outright, BEFORE taking into account non-cash deductions such as depreciation. (Adding applicable non-cash deductions would make the numbers even more attractive, but this property is positively geared prior to doing this). Positively geared property sounds great in principle, but it is usually difficult to buy property that is positively geared from day 1 and that ALSO has decent capital growth prospects. That being said, many properties BECOME positively geared over time. This is because as rents increase over time due to inflation and rises in rental demand, the income of a property investment typically increases until the property becomes positively geared. 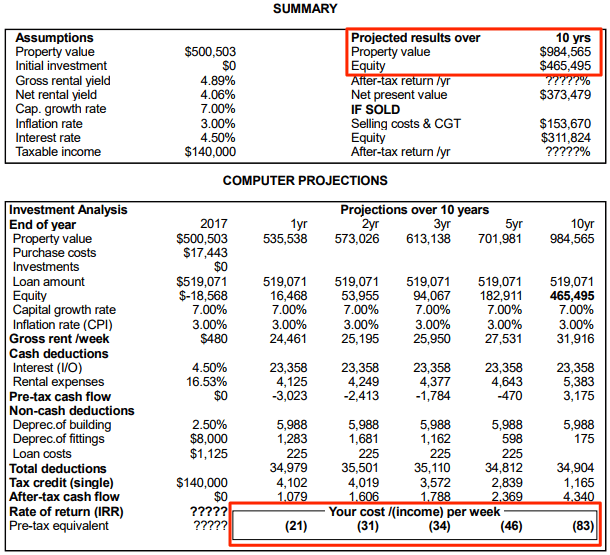 (In the financial model above, you can see how in year 10, the property is producing $3,175 in pre-tax cash flow. At this point, the property is positively geared. The flip side of positive cash flow is negative cash flow. Like the name implies, a negative cash flow property is one that costs you money to hold. The answer is, once the future capital growth is taken into account, they are predicting that they’ll be better off overall. However, on the way, the investor has to wear the cash being sucked out of their wallet every week. There’s also a risk that negative cash flow may hurt an investor’s ability to add more property assets to your portfolio, which is one reason why 7 out of 10 investors never get past property #1. Property values have appreciated in Australia to the point where many properties in urban areas in particular are negative cash flow. Achieve your goals faster: Positive cash flow properties increase your income and therefore your ability to buy your next property sooner. It’s like a flywheel that’s spinning faster and faster. Reduced Cash Flow Risk: Positive cash flow properties are stand-alone. If something unforeseen were to happen to your income, you’re far less likely to have to sell your investment. Negatively geared properties cost you money to hold, and the moment your income drops, you can find yourself short of money and in a position where you have to sell quickly. Double Whammy Effect: cash flow positive properties enable you to lock in weekly cash flow, while ALSO gaining exposure to upside capital growth. For this reason, many investors prefer this strategy. That’s the upside – but what about the potential downside and how to protect yourself? Positive Cash Flow Property can be a lucrative strategy for investors, but like all property investment strategies, how you execute is also critically important. Beware of High Risk Property Types: certain property types such as serviced apartments, hotels or holiday rentals can typically show strong positive cash flow “on paper”. But beware! Often these property types don’t have strong growth fundamentals. What’s The Growth Outlook? $20 or even $100 per week in your pocket is nice, but only if growth is also factored into the equation. We scour hundreds of suburbs and thousands of properties to identify properties with strong growth fundamentals. Watch Out For Bells And Whistles: by “bells and whistles”, I mean sweeteners such as limited time rental guarantees that make a property cash flow positive, but only as long as the rental guarantee applies. You need to look at what the general rental market will pay after the guarantee expires. And also question why a rental guarantee is being offered in the first place. How Is The Positive Cashflow Derived? Remember that positive cash flow properties give you both cash and non-cash tax deductions. Non-cash deductions are depreciation on buildings and fixtures and fittings. However, if the positive cash flow is derived mainly from a huge depreciation schedule, you should be wary. Is The Depreciation Claimable? Depreciation of fixtures and fittings is only claimable if you’re the first owner of the property. So if you buy a new property, you can claim these amounts. If you are the second or subsequent owner, you can’t claim these deductions. What About Interest Rates? Bank interest is usually a major expense item for property investors, and if interest rates rise substantially, that may turn your positive cashflow property into a neutrally or negatively geared property. So it is prudent to allow for interest rate increases in your modeling, as well as consider fixing your interest rate for a period of time. Double Check Your Assumptions: financial models are only as good as the inputs and assumptions that drive them. So if you are expecting a certain rent, conduct due diligence to ensure that rent can be achieved. If you’re expecting growth, make sure the relevant growth drivers are evident in the suburb. Being aware of potential risks is a natural part of any investor’s due diligence. Don’t let the risks put you off taking action (because the cost of inaction is huge). However, make absolutely sure you do your homework in order to make high quality decisions. 7. Where To Find Positive Cashflow Properties? However, the Australian property landscape has shifted in a way that benefits investors who know where to look. In other words, high quality positive cash flow properties are now available in areas that are also poised for growth. Never before have we had access to as much up-to-date property data. The problem isn’t getting the data. It’s interpreting the data. And then taking action on what that interpretation means. Most people look at historical data – things like median price growth over past year. While these things are helpful, they generally tell you what has already happened in an area. When looking for pockets of cash flow positive potential, we do take these things into account. Economic Growth: Strong economic growth creates jobs. This attracts people to an area, increasing the demand for housing. And according to the dependable principle of supply and demand, property rents and prices go up. Limited Supply: Prices increase the most when demand is strong and supply is limited. That’s why house prices closer to population centres (where land is scarce) tend to rise more than prices in small centres or rural towns (where land is abundant). Surrounding Suburbs: A suburb with more expensive neighbouring suburbs often enjoys higher growth. This is known as the “Ripple Effect”. We often look for locations that will benefit from the higher prices in surrounding suburbs. Vacancy Rates: Low vacancy rates lead to greater rental demand which means higher prices and less time without a tenant. Vacancy rates of less than 3% are one good indicator of solid rental demand, ensuring your property will never be vacant for much more than 1 or 2 weeks every year. Rental Yields: High rental yields boost cash flow. A rental return of around 5% or more is a positive signal. Infrastructure: Local amenities have a powerful influence on vacancy rates and rental prices. That’s why we look for locations near schools, universities, shops, transport and other desirable infrastructure. Or even better, locations where infrastructure is being built, but hasn’t yet been priced into local property market values. Recent Price Movements: If a suburb has recently doubled in price, it’s unlikely it will double again anytime soon. We study trends and look for suburbs that are set for future growth. Valuation: While the true value of a property (or anything for that matter) is the price someone is willing to pay for it, we prefer to take a conservative approach and rely on professional, independent valuations as a reliable guide. Potential Tax Benefits: Price is only one factor in a positive cash flow property investment. It’s important to consider all aspects of the equation including the individual property, structure and funding. Depreciation can play an important role in the cash flow equation. That’s why we have a team of experts assessing each positive cash flow property opportunity from all angles. If you can satisfy the above criteria, then it’s very likely you’re looking at a property that will perform very well in your portfolio over the medium and long term. The tips and advice in this article will help you understand how positive cashflow property works, as well as some of the benefits and risks to consider. One potential option is for you to go it alone and conduct your own research to locate, evaluate, negotiate and purchase the right positive cash flow property for you. Alternatively, you may want a little help. If that’s you, then we invite you to request a free, no obligation Property Investment Strategy Session. During this session, we’ll first seek to understand your situation and goals. Then based on what we discover, we will source well-researched property that is a match for your budget and desired outcomes. The properties we recommend are typically cash flow positive and located in growth areas close to major population centres. As you know, the property market waits for nobody. It’s no use regretting opportunities that have passed. We hear almost every day from investors who say, “If only I had bought in Location X or Location Y 10 years ago!”. Now that opportunity has passed and can never be retrieved. However… new opportunities now exist that, 10 years from now, will look like a bargain. So please make a time to chat to find out what your options are and how Smart Property can help you can grow a profitable property portfolio through positive cash flow properties.